School Policies, Student Body, What's New? From May 15 through May 17th, the Newfound music students and Thespian Society will be going on a trip to New York City. For a price of about $450, this three day, two-night trip will take the students to two Broadway shows, “Once on This Island” and “Hello Dolly.” The students will also spend time in Times Square shopping and hanging out at the hotel’s pool. Every other year, the music department goes to a competition or to see a musical performance. Since the music department went to a competition last year, this year they went on a performance trip. For this trip, NRHS faculty and administration believed it would also be a good experience for the Thespians in Newfound to see Broadway live, as well. Since the price of this year’s trip was higher than normal, there were students who could not afford to go. However, many students raised funds to cover the cost of the trip. “I waited a little longer until I had all my funds to pay off the whole trip, and used all the fundraisers I could to pay it off myself,” stated senior Makayla Pixley. There were also other activities throughout the trip that would have cost extra if they were not part of the original price. 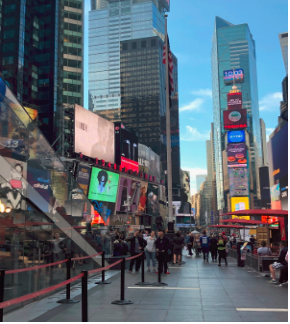 “The cost of the trip is absolutely reasonable for what the students will experiencing; we are going to New York and seeing two on-Broadway shows,” stated Victoria Roman. The date for this band trip occurred in the middle of the school week and interfered with school work for these students, but both Victoria and Makayla believe that the smartest way to not fall behind is to be proactive and ask teachers for school work before leaving. They will be going to a different state and a different environment, seeing two Broadway shows and it will bring students closer to their music side.